Hello Summer!! Well it feels like it here in AZ. It is in the mid 90's and I am just not ready for it. What I am ready for is this super cute Echo Park Paper line! Let me just do a show and tell. First the tell. -The paper is so diverse in patterns yet the colors are what bring it together. -The stickers are always so fun and happy and this collection is no exception! -There is so much product in the kit you can make crazy amounts of cards or layouts. Great value! -Zilch, Zip, Nada! I love that! 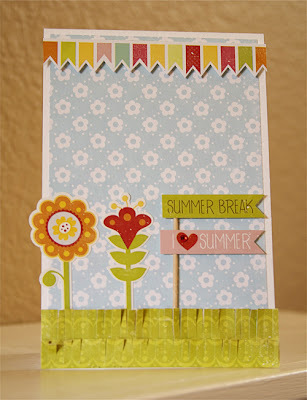 Supplies: Cardstock: Bazzill Basics OP White: Rhinestone: Kaisercraft; Baker's Twine: Lemon Divine Twine by Whisker Graphics; All other supplies Echo Park Paper Hello Summer Collection Kit. Bottom Line: Super fabulous line that just makes me happy. Cute and whimsical and just FUN! What do you think? Does this line make you want to say HELLO to SUMMER? Or are you still hibernating in winter? Leave a comment to be entered to win a Hello Summer Collection Kit by midnight EST on Thursday. U.S. and CANADA residents only. Be sure to leave your email address so that we may contact the winners. Good luck!! Echo park by far is my favorite paper manufacturer this line does not dissapointment. So cute! gotta gotta have this paper!!!! wow! is it ever cute and colorful!! Echo Park is by far my favorite paper manufacturers. They are just so lovely with gorgeous colors and patterns. Definitely getting this collection. What a fun collection. The colors remind me of sherbet. That is yummy too! Totally darling!!!!! thanks for a chance to win! I love echo park! this line looks fabulous! I just love anything Echo Park!! Those cute little birds are just to die for!! love Echo Park! The new lines are terrific! While Summer is not my favorite season (it's just too dang hot and humid here in Houston! ), there's never a shortage of summer photos for me to scrap with...AND we have NINE birthdays in our extended families during the summer. So this package of sunshine would be perfect for all my summer projects! Echo Park is one of my favs! I love the colors on this new collection! This looks like a great new line. Can't wait to get my hand on it. I love the bright colors in EP collections. Great, versatile, happy collection. Love it! I love the colors in this collection. Not to mention the little birds and bannners! What a fun collection! Your daughter is a doll. Thanks for the chance! 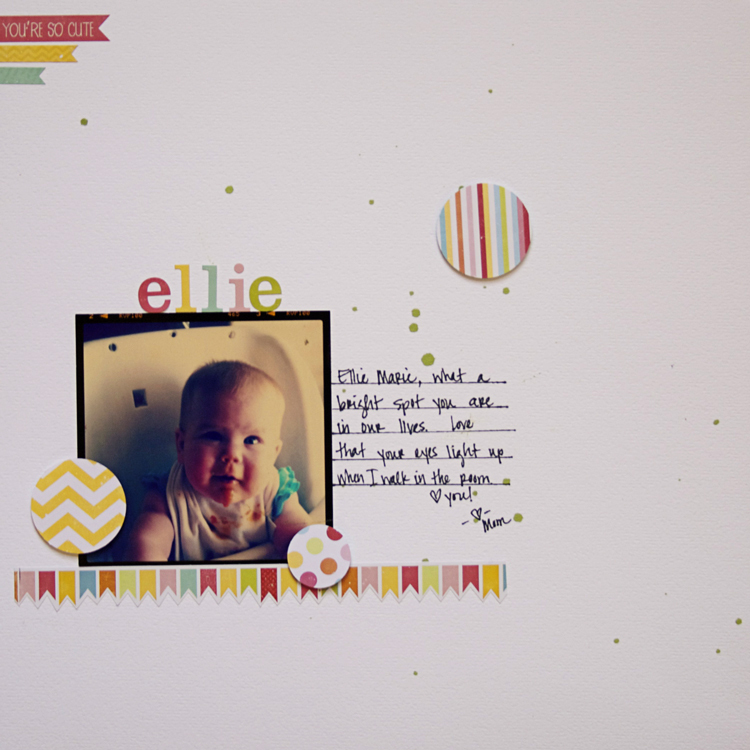 I love this line from Echo Park...the colors are great together and I love the paper designs. I love the bright colors... I would love to whip out some summer layouts with this collection! Love these fun papers, all the banners and clouds! Great collection! I am ready for summer! I am itching to get my garden started and spending more time outside. Love those flag banner strips! And this really does look like a happy collection. That looks yummy. I never used any of the Echo paper before. Echo Park stuff always makes me smile! I L-O-V-E this line. Everything Echo Park makes me happy! You made great stuff with this paper pack! This is such a cute, happy collection! So bright, cheery and fun! Can't wait to use this line for my kids' summer memories! Everything EP is my favorite and I would love love to win this summer collection as this is my fave too!! Oh, I am so ready for summer and this collection could help get me there! I love this collection too, so ready for summer! And the layout is super cute! I like the colors. They look really great together, and will mix and match well. 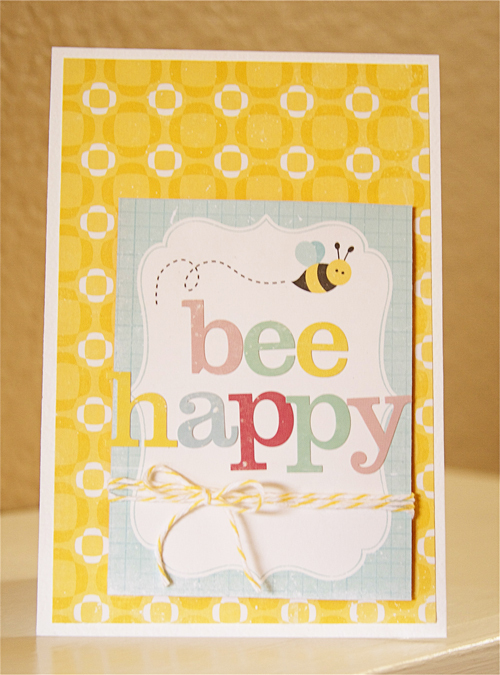 I also like the bee image--perfect for springy/summery cards and other projects. The classic striped pattern, and others are great for so many different projects, not just cards, I can see myself using this entire set. The birds and flags are my favorite images on the papers. I would love to be able to use these papers to make some come over for lunch invitations for some friends. The papers aren't just for kiddos. They also have nice, thick paper. Echo Park is one of my favorite paper lines and this new one is at the top of my must have list! 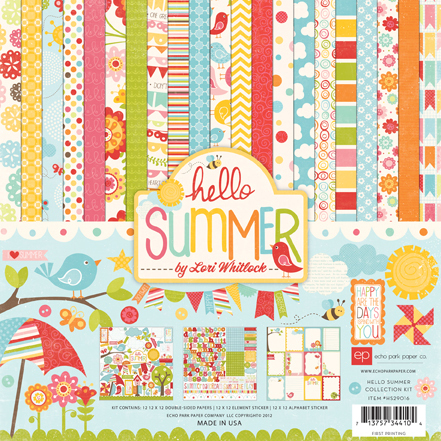 Gorgeous happy colors and designs-definite winner in my opinion. Oh, these papers are SO fun and cheery...love it! I would use it for so many projects! Love EP & Love Hello Summer! it is so bright and cheery would LOVE to have it! bright and cheery-normally I am not addicted to whimsy, but there's something about this that rings my chimes! Wow! Hello summer looks like a ton of fun! I loved this when Echo Park first shared this line and I still love it! I hope to pick some up soon!